Irrespective of its merits and eventual fate, the basic income proposal means that this election is now focused firmly on the economy. Congress president Rahul Gandhi’s announcement about minimum income guarantee (MIG) is the first big idea introduced in the run-up to the 2019 Lok Sabha elections. So far, the election was building up towards one of the many vacuous and noisy contestations that we have witnessed in the last few years: a last-minute too-clever-by-half quota for poor upper castes, brazen attempts at stoking Hindu-Muslim conflict, now-you-see-it-now-you-don’t mahagathbandhan, cynical coalitional moves, election eve party hopping and media games of who-abused-whom. In this context, political commitment by the largest opposition party to guarantee minimum income to all poor cannot but stand out. MIG is not yet a game changer. At the moment it is an empty shell, a shiny cover with nothing inside. Rahul Gandhi’s speeches in Raipur and Cochin were woefully short on any substance to back this big idea up. All we know is that the Congress is committing itself to some kind of income transfer to benefit the poor, should they fall below a minimum level. We also know, from Rahul’s tone, that this is not a casual throwaway remark, that the Congress attaches a lot of weight to this promise, that we can expect a lot in the coming days. However, unless you are an ardent Rahul Gandhi fan and trust that he will implement whatever he promises, at the moment there is nothing to distinguish this announcement from ‘pipe dreams’ like doubling of farmers’ income. For all these limitations, the announcement about minimum income guarantee has already achieved something: it indicates the direction this election is likely to take. The Congress has already all but committed to a nationwide farm loan waiver. Add to this the idea of minimum income guarantee, and it is clear that the opposition is pushing this election towards economic agenda. It is also clear that the Congress is going to focus on the economically poor, socially marginalised groups like Dalits and adivasis, plus neglected sectors like agriculture and rural India. Other non-National Democratic Alliance (NDA) parties are electorally powerful, but ideologically vacuous and are likely to follow the lead given by the Congress in terms of national economic policies. This leaves the BJP with little option except to match or better this proposal in the coming budget. Over the next few weeks, the idea of MIG would be elaborated, debated, criticised and trashed. But irrespective of its merits and eventual fate, the proposal and its timing have ensured that this election is now focused firmly on the economy and that the last person will come first, at least till the elections. This is the last thing Prime Minister Narendra Modi would wish for. Will MIG become the game changer that the Congress has been perpetually waiting for? It all depends on the design behind this idea of which we know very little as of now. We know that this is not a proposal for Universal Basic Income (UBI), a flat cash handout to all citizens irrespective of their means. This is also not one of the modified basic income supplement proposals recently put forward by economist Pranab Bardhan or former chief economic adviser Arvind Subramanian et al. This is in the nature of top-up cash support for any family that falls below a bare minimum income threshold. Yet, there are several issues that need some clarity. First, will the MIG be a government scheme, a discretionary budgetary item, or a statutory right like rural employment guarantee under MGNREGA or the right to food under NFSA? The way it was presented, it appears to be a proposal for a guarantee backed by a statute. That is how it should be, but we need to know this for sure. Second, what is the minimum amount that would be guaranteed as income? Assuming that it is family income that we are talking about, we should be looking at something around Rs 18,000 per month. This is the minimum monthly salary fixed by the seventh pay commission for the junior-most government employee, after taking into account the living costs. Logically, the bare-minimum standard of living for the government employee should also hold for every other citizen. You could arrive at this figure through another route. If you think of a family of two adults who work at Rs 300 a day-the prevailing average minimum wage-it adds up to Rs 18,000 per month. Whatever the amount, the proposal can be taken seriously only when we hear something concrete in this regard. Third, what is the mechanism for selection of the ‘poor’ eligible for this support? Surely not those who declare an income below Rs 8 lakh a year! On a more serious note, defining and identifying the poor is one of the most difficult exercises, notoriously prone to errors and frauds. The whole point of the UBI was to avoid the problem of targeting. The Congress would need to come out with a smart and credible mechanism, different from the usual poverty eradication schemes that suffer from what Abhijit Banerjee and Esther Duflo call Poor Economics. Finally, would MIG supplement or substitute some of the major schemes that target the poor such as the Public Distribution System and the Integrated Child Development Scheme? In a scheme like MIG, the devil lies in the details. Congress spokespersons tell us that a lot of homework has gone into this announcement. That claim should be tested over the next few weeks, by the media, by experts and by the public. The last thing this country needs is another ‘jumla’ sarkar. But more than direction and design, a proposal like MIG is about determination or political will. Is this just a pre-electoral itch which the leaders find a way to wriggle out of once they are in power? Or is the Congress willing to put money where its mouth is? Money is what it would boil down to. Any form of MIG would cost the government big time. Arvind Subramanian has calculated that a miserly version of his UBI scheme would cost 1.3 per cent of the GDP. Professor Pranab Bardhan estimates that if his version of UBI is given only to women, it would cost 1.6 per cent of the GDP. I cannot imagine how any serious MIG could cost less than 2 per cent of the GDP. That amounts to about Rs 3.5 lakh crore a year, over one-seventh of the budget of the central government. This cannot be funded with current revenue level or with some additional surcharge. A recurring payout like this one cannot be met with one-time disinvestment etc. No matter how you do your budget maths, something like this cannot be implemented without raising tax revenue. This could take the form of doing away with unnecessary tax exemptions for the rich, higher rates for upper income brackets, or levies like a turnover tax, or a wealth tax, or inheritance tax et al that do exist in many capitalist countries. Is the Congress willing to commit itself to such a policy? If it is, and is willing to say so publicly, that could indeed be a game changer. It seems, it has become mandatory in any social commentary to label “dalits & adivasis” as marginalised. Marginalised from where, considering that there are innumerable opportunities of livelihood? Right from parliament to gramsabha, there is mandatory representation through reservation, in schools, colleges, jobs, everywhere. How can people with such guaranteed and preferential rights be called “marginalised”? For how many centuries should people of India be terrorised and forced to surrender their rights in favour of the so-called marginalised? For how many centuries should India put up with the false theory of marginalisation being peddled by commentators who are labouring under oppression of political correctness? As other political parties announce various schemes beneficial for the poor,needful classes and else, Congress too has the same right. At the same time, the party must not forget the economic and financial condition of the nation. Any announcement related to the economy affects the country’s infrastructure. The governing aspirants must think over it time and again that how would the end met amicably, without any hazardous consequence. As the Congress has announced Minimum Income Guarantee(MNG) and the party spokespersons are saying that homework is done. On this point do agree with the author Yogendra Yadav how can it be proved until it is tested. On Congress’ part,there are several experts like former PM Dr. Manmohan Singh, former Finance Minister P.Chidambaram. Rahul Gandhi must request them for proper guidance from time to time. Populous announcement won’t do now. If it is continued blindly, would surely bring mess to fore. It would certainly cost to the country. The economy might collapse or circumstances like Venezuela shrouds the country. India has reached the limits of its taxable capacity. Direct taxes and GST are both falling short of projections. No wonder instructions have been given to tax authorities to start gouging. No one should believe these fairy tales of vast stores of income and wealth escaping taxation. Many households are dipping into savings to sustain consumption. The economy is going through worse times than I have ever seen. Our masters – current and future – should be focused on getting growth purring again. Socialists will make India a country of Freeloaders and beggars. Capitalists and their cronies have already reduced an average Indian to being a beggar – DeMon killed people, caused employment losses, destroyed businesses and families and so did GST. Not supporting the poor when he or she is in distress is a sickening ideology – worst consecutive droughts in decades and the ‘great leader’ is balancing budgets but wasting tax money on himself. What ideology or policy choice is that? Money that the government collects is money for every Indian once it is collected and the government leadership has an obligation to spend it on people who need it the most – not fat cat politicians or their cronies who fund their elections. Please do read the directive principles. We are not talking about any ism or ill-founded beliefs, driven by equally ill-founded ideology – we are talking about the government’s obligation and duty to the people of our country. a politician does no favour to anyone by allocating resources to someone who needs them the most. This is what Modi has been shouting from the rooftop for 5 years – saying that the Congress did not do enough to help the poor. Was that just a jumla and the resource allocation does not have to follow the statements of the leader. it is neither about Congress or BJP – it is about what the individual leaders of these parties and their choices. They own it us and not other way round, as they are neither kings or feudal lords. It is good to see you supporting the idea and I agree with you that it should be a Right to Minimum Earnings or even going further to a Minimum Standard of Living. It must become a legal right. I am sure that there will be leakages in implementation, and we must make effort to minimize them. But there are leakages in every government scheme – irrespective of who is using it. Companies reclassify their regular expenditure as R&D to claim weighted deduction. Individuals produce fake HRA receipts to claim deductions. Big ones will set up shell companies to cheat on taxes and loot public money. Toll collected is not necessarily equal to the toll accounted for. We will have problems with identification of who are the poor who need support. But it does not mean that we should not make an effort. I am really glad that the Congress has woken up to the reality of India. We are a poor country and with large number of people being poor. People are being forced to live a life, which includes sleeping on footpaths, living in slums without basic sanitation and a lot worse. Our fat cat politicians are probably blind as they don’t see it. I see it every day, in all the cities that I go to. I have never understood that how someone can say one thing and do exactly the opposite. 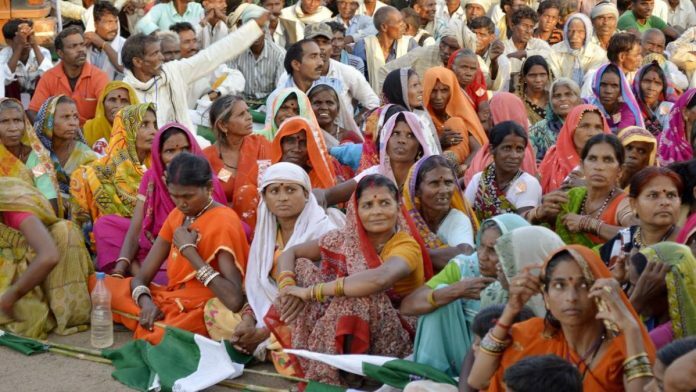 MNREGA was one the best policy choices that the UPA had implemented and raised demand for goods and services across the board in rural India – the same way as the 6th Pay Commission did for rural and urban India. We can not have a situation where a vast majority of people are told that they have no right over resources and a small vocal minority that funds elections gathers everything that comes their way. It was stupid on UPA’s part to cut down MNREGA spends and provide fuel subsidy. They paid the price and so did the country. I am really amused with the questions that the ‘darbari’ anchors are asking. Farmer distress was visible at the time when the farmers were suffering – droughts of 2014 and 2015. Some of the most severe droughts in our history. Modi and company were sleeping are running around the world for self-promotion in the name of raising our great country’s profile. Everyone in the world recognized India and Indians for their capability and sincerity of effort – much before Modi came. We did not need him to waste thousands of crores on self-promotion to tell us that India is great. Same money spent on the poor would have served the country much better. I have never understood – how a man can dress up for fancy videos, show that he is doing exercises (in a fancy environment) when people are dying on the road in the cold – every winter. The man also told us that he understands what it is to be poor. Commendable. May not agree with you entirely. But like your maturity of thought. Missing this in even people at high positions. We need statutes that gaurantee livelihood. We need similar things in education and healthcare. Similar statutes need for environmental protection and reclamation. Policy needed to ensure resources are available for long term to growing population. Can we have independent police commission like election commission reporting to the President and Heads appointment done by committee of supreme court / high court judges judges. Half of corruption especially the sundry and low level will be controlled. Security will absolutely spot on. Gali Ka dada cannot bark so easily as corporaters and MLA cannot defend them anymore. Livelihood education Healthcare, security and environment are 5 most important things for our nation. Many of pay schemes configured by the Indian state are after years of after thought by various Beuracrats, survey agencies, commissions. Those tend to slow down our development speed added up by corruption in public and private sectors, but are surely taking us in right direction. I would like to see a bill on political parties funding. To me only 5-10 percent funds to be allowed by cash or bonds. Beyond that funds to be disallowed or with 40 percent tax. Corporate houses and trusts be allowed substantial amount in funding. Election expenses limit to be increased 3-4 fold. All this will bring better transparency and trigger white economic growth.